From the south: Take Exit 22 from Interstate 87 (the Northway). Follow the exit road downhill for approximately 1 mile, staying left at the fork, until you reach the traffic light on Rte. 9N. Go left onto Rte. 9N and continue 7.3 miles north to the Coldwell Banker King George Realty office at 4613 Lake Shore Drive, Bolton Landing. The office is a large, white building on the left (west) side of the road. From the north: Take Exit 24 from Interstate 87 (the Northway) onto County Rte. 11. Follow County Rte.11 east for approximately 5 miles. At the foot of County Rte. 11, turn right onto Rte. 9N. 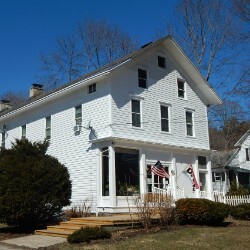 Follow 9N through the center of the town of Bolton Landing and continue south approximately 1.5 miles to the Coldwell Banker King George Realty office at 4613 Lake Shore Drive, Bolton Landing. The office is a large, white building on the right (west) side of the road. Situated on the shores of Lake George, The Queen of American Lakes, the agents in Coldwell Banker King George Realty's Bolton Landing office specialize in Lake George real estate including Bolton Landing lakefront, Hague, Silver Bay, Ticonderoga, Dresden, Putnam, Gull Bay, Assembly Point, Kattskill Bay and Cleverdale residential properties and land.